We build habits one step at a time, and the same is true of holding meetings. I read an interesting post recently about meetings. 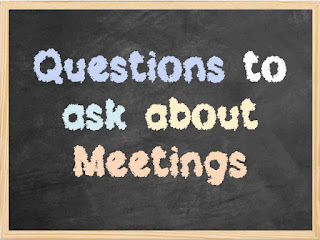 While most of the useful contents of that post are covered elsewhere (here, here, here, here and here), there were some useful questions about meetings, which I have added to from my experience. Do we have a meeting agenda? Do we know the location, the start, and the finish times? Do we know why we’re having this meeting? Do we know why we in particular have been invited to this meeting? Are we already up to date on what will be discussed at the meeting? Do we know everyone else who will come to this meeting? If we don't, what do we need to know before going? Do we have minutes of the last meeting? If we can answer any of these with a "No", we should contact the chair, and ask for clarification. Is there any conflict which might derail the meeting? Will any contentious issues be discussed? Do we have any homework that we need to do before the meeting? What tasks did we say we would have complete by this meeting, but are not complete? If we can answer any of these with a "Yes", we should email the chair with a status update, or your thoughts on a path through difficulty, before the meeting. Did the items not covered get parked for next time? Are all the actions clear? Did we action all that needs to be done? Did we record how actions need to get done? Did we record who actions need be done by? Did we record who is going to keep track? 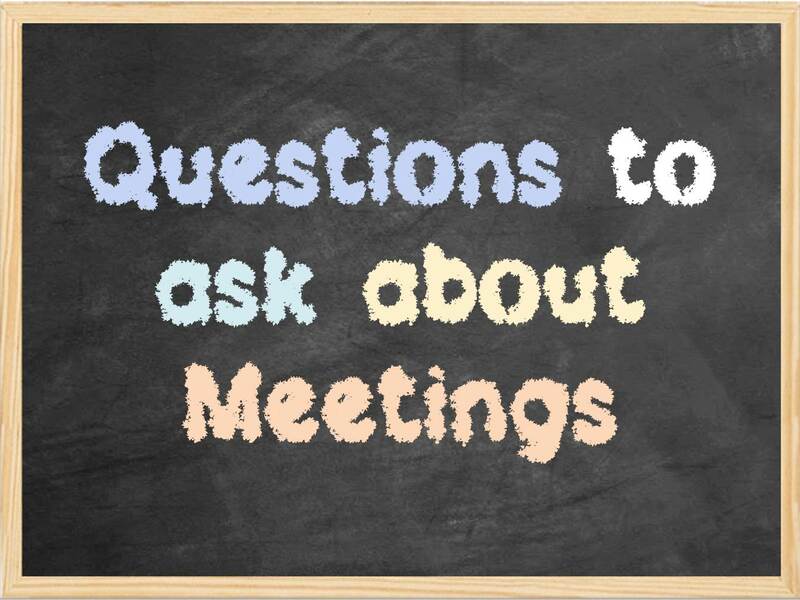 Running through these questions and following up on any that we answer "No" to BEFORE the minutes come out will help the next meeting be more effective. Remember, we build habits one step at a time.